Universal Music Group has released the 90-minute SLASH documentary Slash: Raised On The Sunset Strip, on Blu-Ray and DVD. One of rock's most iconic figures is profiled like never before in Slash: Raised On The Sunset Strip, a revealing and insightful film presented by DirecTV and Guitar Center. Combining new and archival footage with personal anecdotes from the legendary musician himself, as well as from many of his influences and colleagues, the documentary paints an intimate portrait of a hard rock hero's past, present and future. 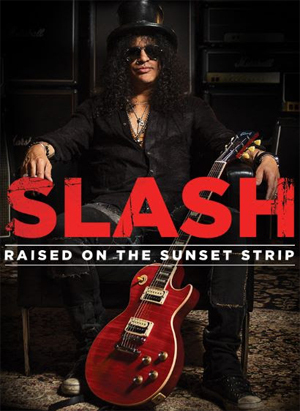 Slash: Raised On The Sunset Strip features interviews with: Dave Grohl (FOO FIGHTERS), Joe Perry (AEROSMITH), Alice Cooper and Nikki Sixx (MOTLEY CRUE), as well as Slash's GUNS N' ROSES and VELVET REVOLVER bandmates Duff McKagan and Matt Sorum. Follow Slash’s journey from his start on the Sunset Strip to his current album World On Fire.